MAHARAJA Bhupinder Singh’s collection of medals, rated as the world’s largest collection during his time, is truly mind-boggling now. He outdid himself in collecting medals in the same way he had outdone himself in so many fields. He headed the Chamber of Princes despite being the head of a small princely state. Even the present Cartier of the Cartier House who was here last year to see the collection went on record to say: "It would be an exercise in futility to put a price on this collection," adding "one can truly understand the meaning of priceless after seeing the collection’’. The medal collection, which was only for VIP eyes in the past, was opened to the public for the first time during the Heritage Festival in Patiala to give a boost to the festival as well as Patiala as a tourist destination. The collection is truly priceless both in historical content and commercial value. Seeped in history, it has the most important medals in the world besides being a representative collection from many countries. It would be difficult to calculate its commercial value with the medals being studded with gold, diamond, rubies and other precious stones. The Phulkian rulers were apparently given to grand gestures. Like his forefather Maharaja Mohinder Singh, who bought the entire collection of chandeliers of a Calcutta showroom after the showroom owners took him to be a commoner when he went to visit them, Maharaja Bhupinder Singh bought the entire medal collection of Spinks and Sons of London. Spinks had been making medals for governments and rulers since long and used to buy back medals of rare value from families who fell in troubled times. Buying the Spink Collection had a cascading effect with others who wanted to sell medals in their possession gravitating to the Maharaja. The rare medals in the collection include the "Order of the Garter" (1348) which is known as the world’s oldest historically documented order of chivalry and was founded by King Edward of England in 1348. The highest class of this order is studded with diamonds which can be seen in the gallery. 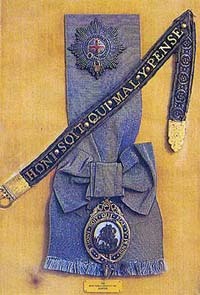 The motto of the Garter is Honi Soit Qui Mal Y Pense or "Evil be who evil thinks." Another order which has been restricted to only 16 men is the "Order of the Thistle" (1687) with the motto Nemo Me Impune Lacessit (No one provokes me with impunity) which is inscribed on the badge which shows St. Andrews holding the Cross. The gallery has as many as five Victoria Crosses in its collection. 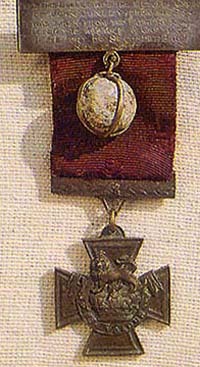 The Victoria Cross, made from canons seized in the Crimean war, replaced the Order of the Garter in 1856. One of the Crosses even has the bullet which had injured the recipient J Dunley at the siege of Lucknow during the 1857 mutiny. The highest gallantry awards of France—"The Order of the Holy Ghost" (1579) and later when it was replaced with the "Legion of Honour" by Napoleon Bonaparte also find pride of place in the gallery. The Iron Cross, which was instituted by Prussia for the first time in the war against Napoleon in 1813 is also displayed in the gallery. A rare piece in the collection is a medal which contains 14 bars. This was awarded to an Artillery driver G. Legg who took part in 14 campaigns and acquitted himself with bravery in all of them. "The Order of the White Elephant" which bears figures of elephants bears its inspiration from Buddhist Jataka tales. The Queen of Maya, the mother of Lord Buddha had a dream that a white elephant had entered her belly which was interpreted to mean that she would have a son who would be a great king or a great saint. Indian medals in the collection include the "Order of Ranjit Singh" which bears the portrait of the Maharaja in relief with two swords, a bull and an eagle. Another is the "Auspicious Star of Punjab" which was presented to the Earl of Auckland, the Governor-General of Lahore, when he visited Lahore in 1838. 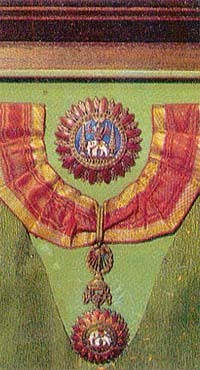 Maharaja Bhupinder Singh himself also instituted orders and decorations. 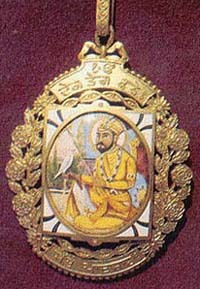 One of these is "The Order of Guru Ghar Manya Mandal" which carries the portrait of Guru Gobind Singh. Another is the "Yadhvansh Manya Mandal" which bears the painting of Lord Krishna and Radha in enamel.